Disclosure: PawZaar sent a Have Paws Will Travel Dopp Kit and pack of PawZies to Lapdog Creations, free of charge, for review purposes. Lapdog Creations only shares information we feel is relevant to our readers, and all opinions expressed are my own. PawZaar is responsible for the giveaway prize. This post contains affiliate links. If you click on one and make a purchase, I may receive a few pennies to assist in maintaining this blog. It doesn't matter if you're getting on a plane, taking a multi-day road trip, or just driving to the local park... it's always nice to have some fun accessories to take with you. 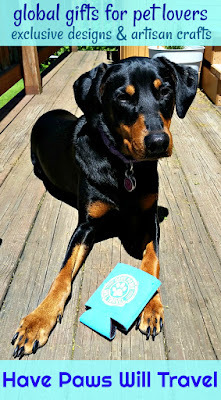 Lucky for us, PawZaar recently introduced some new items to help pet parents show off their love of all things paw this summer, and I get to share two of my favorites with you today! I feel in love with the Have Paws Will Travel Dopp Kit as soon as I opened the package. Not only does it look cool, but it just might be one of the most versatile medium-sized bags ever. 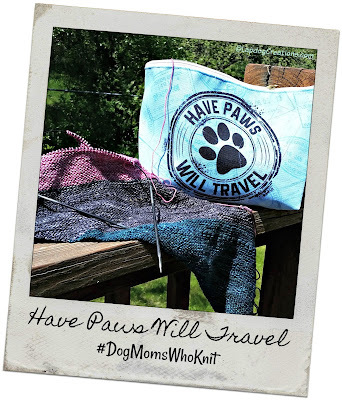 The waterproof bag is 12.5" x 8.5" and features an exclusive Have Paws Will Travel design on a passport stamp backdrop. It has a 100% polyester poplin exterior, non-woven laminate interior, and zipper closure to keep your essentials dry and secure. The eye-catching Dopp Kit is perfect for holding all of your - or your pet's - must-haves. Use it when traveling to hold toiletries, or all those little things you'll want while in flight (book, candy, lip balm, phone, pens, small notebook, etc.). Stuff it full of dog treats, a tennis ball, poop bags, and wipes, and your dog will always be ready for a trip to the park. If you're a fellow dog Mom who knits, it'll be your new favorite bag for small to medium sized projects. Mine is currently corralling the Memories of Juneau scarf. Because the bag is waterproof, it's not only great if you get caught out in the rain, but also makes a nice accessory bag for those lazy summer beach days. I love that I can put it down and not have to worry about the contents getting wet (no one likes wet yarn -- or wet, gummy dog treats for that matter). 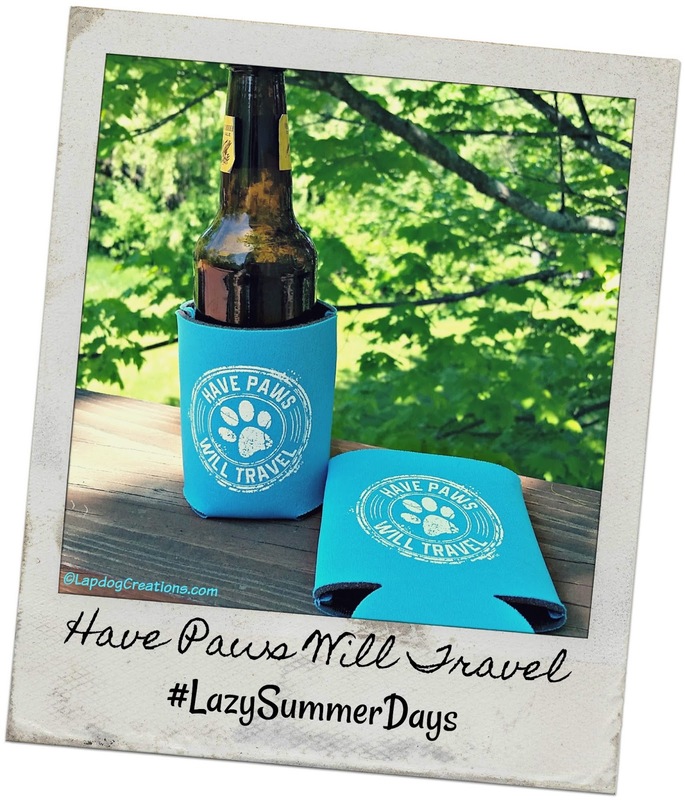 Speaking of lazy summer days, you'll want to keep those beverages cool with the adorable Have Paws Will Travel PawZie! These drink koozies come in packs of two, so you can share one with your best friend too. 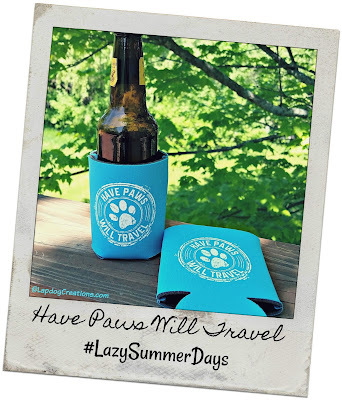 PawZies feature the same fun Have Paws Will Travel design (on both sides) on a turquoise background. They are made of neoprene and easily squish down so you can stuff one in your Dopp bag or pocket. Do you love the Have Paws Will Travel design as much as we do? 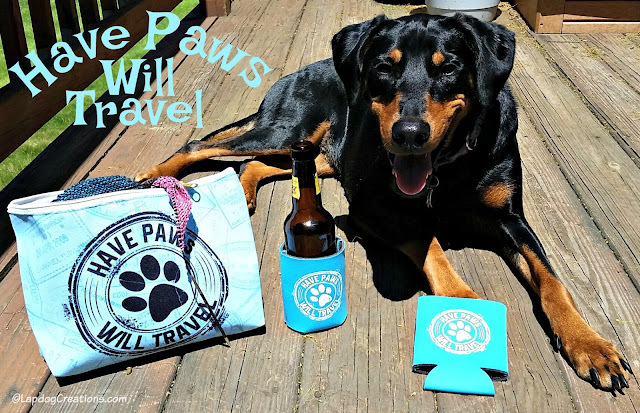 Then grab yourself a Dopp bag and pack of PawZies, and prepare for a fun-filled summer! They also make great gifts, so order an extra or two. Know someone adopting a new pup? Stuff a Dopp bag full of puppy supplies and give it as a "Welcome Puppy" gift! Plus, your purchase truly gives back to animals in need! Whether you're looking for a gift for a pet lover on your list, or just want to treat yourself, look no further than PawZaar! The selection of gifts for pet parents is amazing and every purchase gives back to animals in need -- a true win-win! 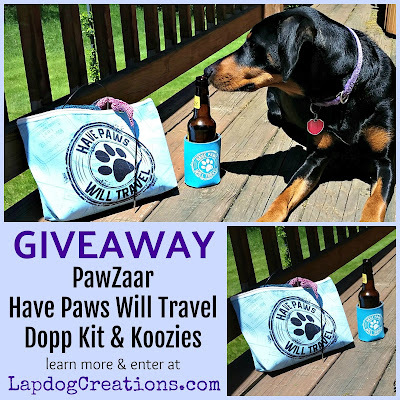 Thanks to our friends over at PawZaar, one (1) lucky winner will receive a Have Paws Will Travel Dopp Kit and a 2-pack of PawZies! It's great that the bag is waterproof. That's so helpful during the crazy summer months. The bracelets I can't pick one!! What a cool package! That bag is super awesome and I love that it's waterproof! I love that 10% of proceeds from PawZaar products benefit animal shelters and rescues. Two of my three dogs are rescues. When we had dogs we could have so used one of these. We were always taking them to the beach and their stuff would always get soaked. I love the bottle koozies. They are pretty and they look like they will keep our drinks cold for a longer time. The waterproof pouch is awesome too. We love the Paw LOVE Aromatherapy Locket. Very nice bag & design, I like the cozies too! There were so many cute things, but I love the paw birthstone necklace! I like the Dog Lover's Pin as a gift for my wife. I love the bracelets the most. I like the adopt cuff bracelet.